Shropshire is one of the largest counties and least populated. It has some beautiful walking country with The Long Mynd (Long Mountain) close to the picturesque village of Church Stretton. 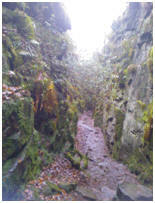 An ancient trackway called the Portway which is 10 miles in length, offering great walking. Wenlock Edge stretches through this county giving panoramic views. The Stripstones is another edge to provide you with magnificent views and exhilatrating walks. Ludlow is a popular town with lovely Georgian and half- timbered Tudor buildings. There is a museum and ruined castle. Shrewsbury has connections back to Roman times. An interesting town which sits on a narrow loop of the River Severn. There is the castle and Shrewsbury Museum and Art gallery to visit. Ironbridge Gorge has plenty to offer with its Gorge. Numerous museums including Blist Hill Victorian Town, Coalport China Museum, Museum of Gorge, Jackfield Tile Museum and Museum of Iron. Staffordshire is best known for the home of Alton Towers. One of the country?s most popular amusement parks with its rides and attractions. The City of Lichfield has a cathedral and a very pleasant place to visit. Samuel Johnson the famous critic was born above his father?s bookshop in the Market place in Lichfield. Samuel Johnson compiled the Dictionary of the English Language. Litchfield is about 18 miles north of Birmingham. Close by is the National Arboretum which is the UK?s Centre of Remembrance. It is open every day and entry is free. The Arboretum is set in 150 acre of gardens and trees with memorials for all those that have died since the Second World War whilst in service to the country. Staffordshire is well known for its pottery and there are still plenty to visit in the area particularly in Stoke-on-Trent. National Trust properties in Staffordshire are Biddulph Grange Gardens, The Rock Houses at Kinver Edge, Moseley Old Hall and Shugborough Estate. There is plenty of walking and cycling at Cannock Chase. The Birches Valley Visitors Centre offers information on the area. There is cycle hire at Swinnerton Cycle Centre. There is also a ?Go Ape activity centre for those that don?t mind heights and want adventure in the tree tops.? Birmingham is the country?s second biggest city ? plenty of interest for the visitor apart from the shopping. The city has many canals which are interesting to travel along on foot or by cycle. The city has a host f museums to visit, the City Museum and Art Gallery, Think Tank ? Birmingham Museum of Science and Discovery, the Museum of the Jewellery Quarter. The National Trust has the Back to Back to visit close to the city centre. You don?t have to travel far to reach the green countryside. To the North West, 3 miles west of Wolverhampton is The National Trust Property ? Wightwick Manor and Gardens. The houses furnished with William Morris fabrics. Many National Trust properties have good parking facilities but please be thoughtful of other users ? try to park in areas of the car parks that won?t hinder others.